On January 25 and 26, Mitsubishi held two explanation sessions for buyers. At these sessions, buyers were informed that the company contracted by Kajima Corporation to install plumbing (Kandenko) had forgotten to install sleeves for plumbing in about 600 locations. As a makeshift solution, holes were drilled in the concrete afterwards and in some cases the rebar was accidentally cut. Fuji News Network reported the incident on January 25, but the article was removed a few hours later. Mitsubishi said that it could take 12 months before they can fully understand the situation and cannot rule out the possibility that the building may be demolished and rebuilt. They acknowledged that the problem was only brought to their attention because of the anonymous online whistleblower and will take extra measures to keep a close eye on the construction of their other projects. The luxury apartment building was to be the first of Mitsubishi’s new ‘The Parkhouse Grand’ series. It is located in the high-end Minamiaoyama residential district near Roppongi, Shibuya, Hiroo and Omotesando. Apartments were priced from 85 ~ 350 million Yen (1,400,000 Yen/sqm), with most priced around 140 million Yen each. 83 of the 86 apartments had already been sold by the end of 2013. The 7-storey condominium was due to be handed over to apartment buyers on March 20, 2014. Buyers have been offered a full refund of their deposit as well as compensation equivalent to 20% of the purchase price. They may also receive additional compensation to provide for out-of-pocket expenses associated with finding temporary accommodation. It is expected that the cost of cancelling the contracts could cost Mitsubishi 2.3 billion Yen (22.7 million USD). Mitsubishi assured buyers that there were no problems with any of their other projects currently under construction or on sale. While there are fears that this incident has hurt their brand image, they are confident that it will have no negative affect on any of their other properties. The developer has had some unfortunate events with some of their projects recently. A fire broke out in The Sanno Tower while under construction in December 2013, and two workers were killed in a workplace accident on The Parkhouse Nishiazabu Residence construction site in January 2014. Despite strict building regulations in Japan, there are still occasional stories of faulty buildings. Most cases are unintentional, with the exception of the Aheha scandal. In 2011, Sumitomo Realty & Development was ordered to return about 370 million Yen to buyers of apartments in a defective condominium in Sapporo, Hokkaido. The building’s earthquake-resistant strength was only at 86% of the minimum level. Otsukyo Station Place (2009) in Otsu City, Shiga Prefecture is the subject of a law suit between buyers and the developer and construction company due to a number of problems including serious roof leaks and falling glass. 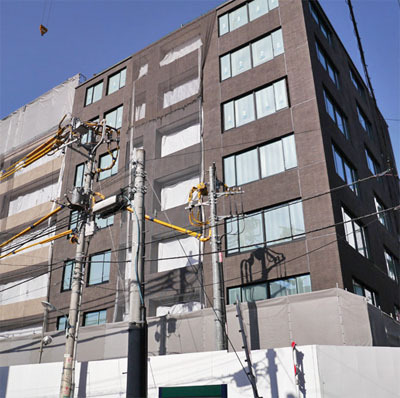 A condominium developed by Daikyo in Kawasaki City in 1997 was recently rebuilt after a building inspection in 2009 found construction flaws that compromise the integrity of the structure. Some of the problems included gaps in the beams and pillars, styrofoam and wood mixed in with the concrete pillars and walls and fewer reinforced bars than indicated on construction plans. Prior to completion of Ichikawa The Towers West Premier Residence (2009) in Chiba Prefecture, it was discovered that there was not enough rebar on the higher floors. The construction company fixed the problem but a number of buyers cancelled their contracts. J Cast News, February 1, 2014. Nikkei Business Publications, February 3, 2014.